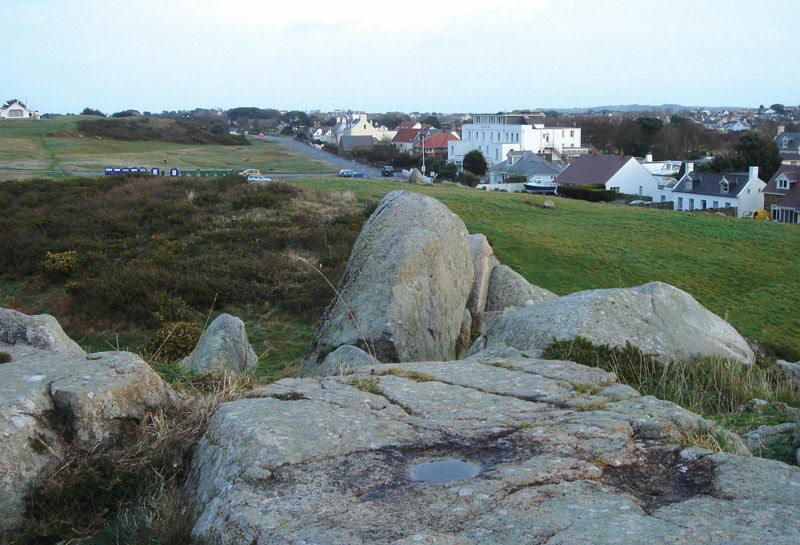 La Rocque Balan stands out (on the right as you look out to sea) from the green undulations of the golf course. It features two bowl like features that have been described as ‘cup marks’ at its summit. One measures 220mm across and is 45mm deep, the other is 63mm in diameter and 25mm deep. Theories abound as to what these were for, including the claim that they were used to catch the blood drops during ritual sacrifice and may also be an example of prehistoric tomb art. They do not look like cup marks (see La Platte Mare) and are almost certainly natural. That’s not to say that they were not used by ancient man. Books that bother to mention La Rocque Balan often infer that the name of the rock is linked to the festival of Beltane and sun god worship. The folklore books tell of the strange ritualistic ceremony on Midsummer Eve where the people would attend carrying lighted brands taking with them conch shells and brass bachins. The rims were encircled with moistened reeds and pulled quickly through the fingers to make noise. Meanwhile the bachins were also filled with metal plates. The blast of cow horns and conch shells being blown added to this. With fires lit at the base of the rock, the people would dance on its summit. Wikipedia.com offers this description of the Beltane Festivals: “Early Gaelic sources from around the 10th century state that the Druids would create a need-fire on top of a hill on this day and rush the village’s cattle through the fires to purify them and bring luck (“Eadar dà theine Bhealltuinn” in Scottish Gaelic, “Between two fires of Beltane”). People would also go between the fires to purify themselves. This was echoed throughout history after Christianisation, with lay people instead of Druid priests creating the need-fire. The festival persisted widely up until the 1950s, and in some places the celebration of Beltane continues today. A revived Beltane Fire Festival has been held every year (except 2003) during the night of 30 April on Calton Hill in Edinburgh, Scotland since 1988, and attended by up to 15,000 people. Beltane is a specifically Gaelic holiday, not “Celtic,” as other Celtic cultures, such as the Welsh, Bretons, and Gauls, do not celebrate it – though many cultures did celebrate a springtime festival known by various names” There can be no denying that the ceremonies held here sound ‘Beltanic’ but that is all from the 10th century so I’d like to explore the earlier period. All over Celtic Ireland, there are depressions very like the natural sink holes on Rocque Balan which are known as ‘bullauns’. The word bullaun means bowl or hollow (from the French ‘bol’?). Bullaun stones are boulders with round or oval bowl-like hollows cut out of the stone and are often made on portable rocks (there was said to be a rock with ‘bowls’ at the feet of La Gran’mère at St. Martin’s church before she was moved), but in several cases are found on outcrops of rock just like here, just in this case they were here already, put here by Mother nature. Various uses for these holes have been suggested: a pestle a mortar type use where grains (or actual rock is ground) with which to heal, curse or ensure fertility. The link to fertility is quite obvious when the rocks just to the south are considered. Carrying on from my conjecture regarding the alignment from La Varde dolmen, if you agree that the main rock could look like a reclining man on his funeral pyre, (hence the bonfires originally) maybe we can reach the verdict that the two outcrops of rock served completely different uses back in the depths of time and then over the millenia it all got mixed up. We cannot be proved right or wrong here with all these theories – we’ll never know – perhaps this very impressive site was used for all those things, after all man has been here for many thousands of years. In the early times we are focusing on, the sea would have only ever reached what is a very low tide level now and L’Ancresse common was a dense forest of trees. Rocque Balan would have towered over this as an important landmark just as it does today.